Toronto and Region Conservation Authority (TRCA) monitors fish communities, aquatic insects, habitat features and temperatures within local streams as well as in Lake Ontario. TRCA offers a number of technical training workshops related to these topics. What do we monitor and why? Benthos are useful as water quality indicators because they live within the bottom of streams or rivers for their lifespan (one to three years), and are sensitive to disturbances in the environment. They can include worms, snails, mussels, leeches, crayfish as well as the immature life stages of insects. Their relatively high abundance and the low cost of equipment make them ideal organisms for monitoring. Data on benthos are collected annually at over 100 monitoring stations across the Toronto region. Over 60,000 benthos was collected in 2018 in support of the Regional Watershed Monitoring Program, habitat restoration projects, environmental assessments and research studies. Members of TRCA’s aquatic monitoring team are provincial leaders in identifying aquatic insects to the Lowest Practical Level, with staff certified in genus level identification by the Society for Freshwater Science. Annually our team offers external training in Ontario Benthos Biomonitoring Network (OBBN) standardized sampling protocols to environmental professionals. OBBN is a multi-sector biomonitoring collaboration led by the Ontario Ministry of the Environment, Conservation and Parks, whereby members can share their data through a centralized database. Fish are excellent indicators of stream health because they are easy to collect and identify in the field, are sensitive to changes in their environment, differ in their tolerance to amount and types of pollution and are sensitive to forms of pollution that chemical tests may miss. Each of TRCA’s watersheds are surveyed for fish communities and habitat features every three years. 2018 marked the sixth year that Regional Watershed Monitoring Program fish and habitat monitoring activities were focused on the Duffins Creek, Carruthers Creek, and Rouge River watersheds. Over 5,000 individual fish species records were collected in 2018. 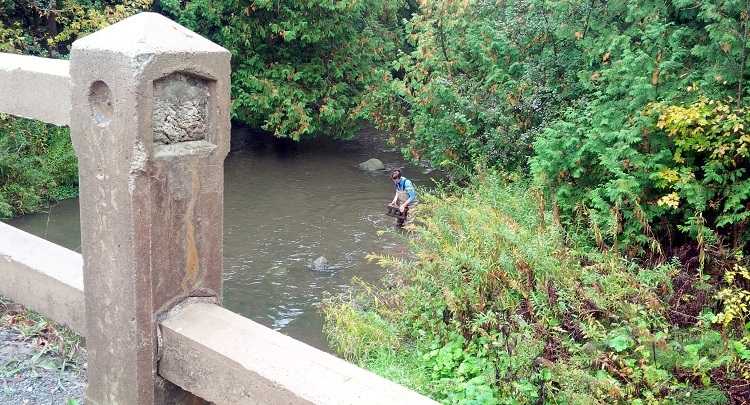 In 2019, the monitoring focus will shift to the Humber River and Etobicoke Creek watersheds. To help predict what types of fish are likely to be found, in-stream habitat characteristics (e.g. stream widths) and bank assessments are completed together with the fish community surveys. Coastal fisheries surveys have also been conducted within Toronto Harbour since 1989 in order to track the effectiveness of Remedial Action Plan measures for the Toronto & Region Area of Concern (AOC). AOCs are formally recognized by the governments of Canada and the United States in the Great Lakes Water Quality Agreement amendments of 1987. Over 10,000 individual fish species records were collected from more than 150 coastal monitoring sites in 2018. TRCA also coordinates Aquatic Habitat Toronto (AHT), a group of agencies that have a vested interest in the improvement of aquatic habitat on the Toronto Waterfront. AHT is focused on fulfilling the goals of the Toronto Waterfront Aquatic Habitat Restoration Strategy and the Fishing In Your Backyard: An Urban Recreational Fisheries Strategy for the Lake Ontario Northwest Waterfront, as well as working with academia on a multi-year fish-tagging study. Additional stream and coastal fish and habitat assessments, as well as fish rescues, are carried out within the Toronto region in support of various habitat restoration projects, environmental assessments and research studies. TRCA collects water temperature data using seasonal and year-round temperature loggers. Temperature is a major factor that determines which aquatic species, fish or bugs, live in a particular stream. For example, Brook Trout rely on groundwater upwellings for spawning. Tracking water temperature can also indicate the influence of groundwater on a watercourse. Toronto watersheds are historically dominated by coldwater stream conditions. The more urbanized the surrounding landscape becomes, the higher the water temperatures. This data helps to measure the effects of urbanization and climate change on stream health. In 2018, water temperature data was collected from over 100 in-stream monitoring locations, plus 36 locations along the Toronto regional waterfront. Mosquito larvae populations are surveyed through the West Nile Virus Surveillance and Monitoring Program. The data collected are used to identify sites of potential concern or hotspots and then follow up with appropriate management actions. LEARN MORE. What are the data telling us? Data analyses continues to show that streams in urban areas with high road densities are less healthy. This suggests that decreases in urban area and road density, as well as increases in natural cover (e.g. % forest), will maintain or improve the health of our watersheds in the future. Healthier sites are generally located in coldwater streams in the upper reaches of the watersheds where there is low levels of urbanization (<10%) and relatively high levels of forest cover (12-40%). Individual monitoring sites in good health are usually located in the Duffins Creek, Rouge River and Humber River watersheds. Unhealthy sites are typically located in streams surrounded by high levels of urbanization (63-100%) and low levels of forest cover (<2%). These sites also tend to have man-made modifications such as concrete lined channels. Most of the impaired sites are located in the Mimico Creek, Don River and Highland Creek watersheds.